A young classical guitarist, let's call her Virginia, recently forwarded me a link to another guitar maker's website, a steel string maker who makes some really nice guitars and has some definite ideas on how to make a steel string guitar sound loud! She asked if I agree with this maker's take on guitar bracing. In the page that I was forwarded, the maker states that he braces the guitar's top so the bridge is locked in place - reduce movement of the bridge and more of the strings' energy is transmitted to the top. Yes, I agree with that, reducing the bridge's movement has been discussed quite a bit in several papers on guitar acoustics. 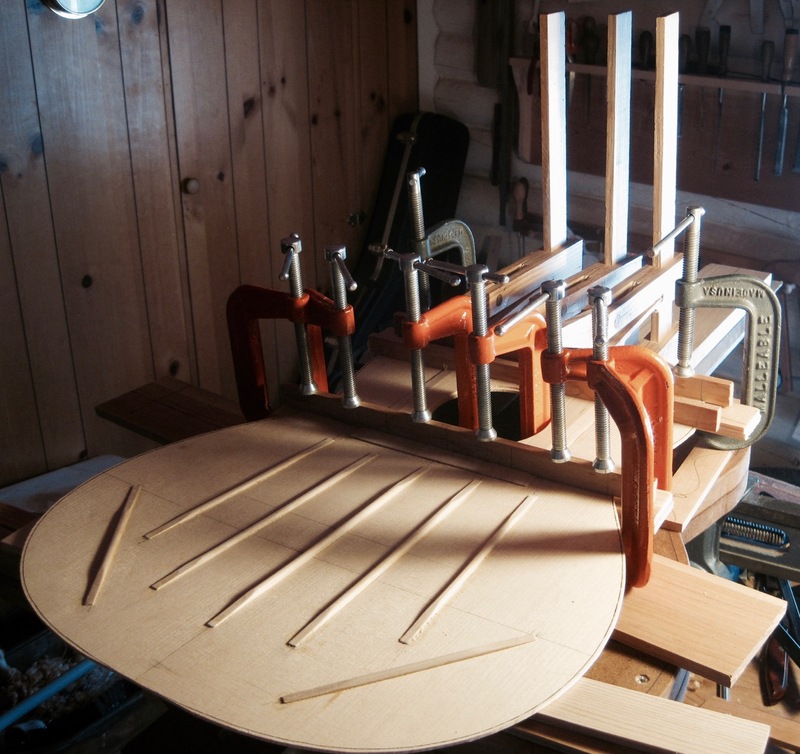 If anyone is interested in reading several articles on guitar acoustics, which include illustrations of how a guitar top moves when a string is plucked, I suggest that you start with these articles by Ervin Somoygi, please click here. Another great website on guitar acoustics posted by the University of New South Wales, is here. You should check out R.M. Mottola's website, Liutaio Mottola Lutherie Information. Yes, Virginia, I agree with the idea of locking a guitar bridge into place, but a classical guitar is different than a steel string guitar. I know both instruments are guitars, but it's like comparing an Arkansas Black apple to a Rome Beauty apple, both are apples, but they don't taste alike. A classical guitar is created to make poetry and music, to have a beautiful sound, a bel canto voice, a voice that has allure and is to be treasured. How the bridge moves on classical guitar top helps give it its "classical" sound. I won't comment about the voice of a steel string guitar, since I really don't like steel string guitars. I know that the current fad in the classical guitar world is to own and play a LOUD guitar, but where is the beauty in loud? Virginia, did you notice in that article you forwarded to me, the words "tone colors", "beauty" or "allure" aren't used? Since the days of Antonio de Torres, classical guitar makers work towards the goal of creating a guitar that has a beautiful voice with wonderful projection. This is accomplished by looking at the guitar as a whole entity, everything must be taken into consideration. The top is the heart of the guitar, but all the other parts give the guitar its soul. 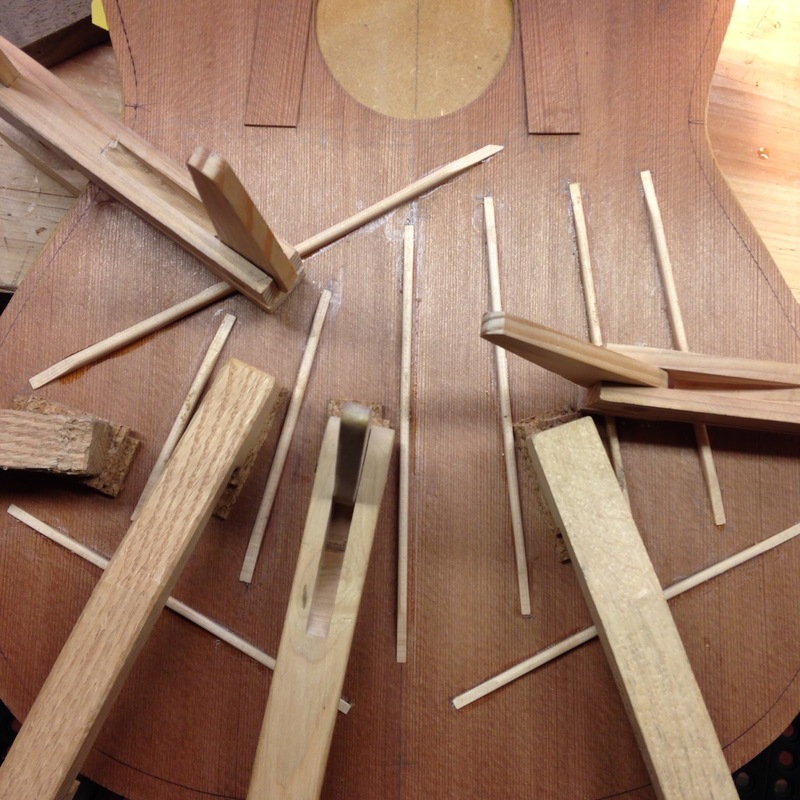 As for bracing the top, well, there are as many ways to brace the top as there are guitar makers, both amateur and professional. A search on the internet for guitar bracing will reveal just that. All those "styles" of top bracing show me that how you brace a guitar top is almost insignificant: how you graduate the thickness of the top, back and side; the quality of the wood that is used; weight of the bridge; lacquer, shellac or oil varnish; etc., etc., these things are probably more important than just how the top is braced. The great Santos Hernandez constantly experimented with how he braced a top, nearly every guitar he made was braced a little bit differently, and the great Antonio de Torres always tweaked his famous bracing, too! To further drive home the important point of it is how the guitar is made, click here to see the latest addition of Orfeo Magazine. Take a look at all seven issues! 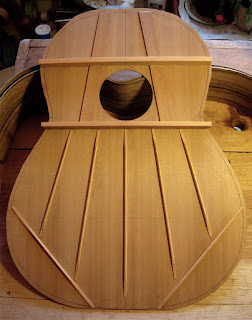 This subject, that of bracing a guitar top, is enormous! There are many schools of guitar making, the Madrid, Granada, Barcelona, German, Australian, American, Japanese, the list goes on and on. The best thing to look for is a beautiful sounding guitar that you fall in love with! Yes, Virginia, there is beauty in the world and not all of it is loud.